They say that there is no short cut to success, and real success always comes after you have paid your dues. After all, Gordon Ramsay did not become the chef that he is today simply by reading a DIY cook book, did he? The same goes when it comes to growing a beard – you will obviously need the right kind of genes in place, as well as patience. Plenty of it, especially when you want to make an attempt to grow the world’s longest beard. 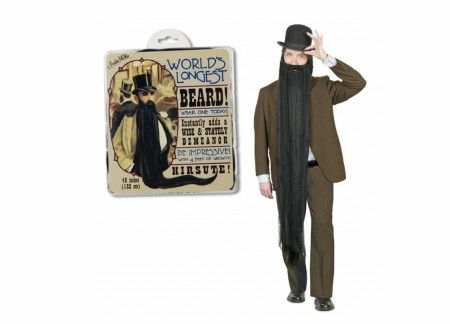 Alternatively, money might be able to solve this conundrum of yours, with the $12.95 World’s Longest Beard which will give you an instant 4-foot long beard without having to wait for decades. Not only that, you need not shave it when you no longer want it, as you can easily remove the adjustable elastic strap and you’re good to go.